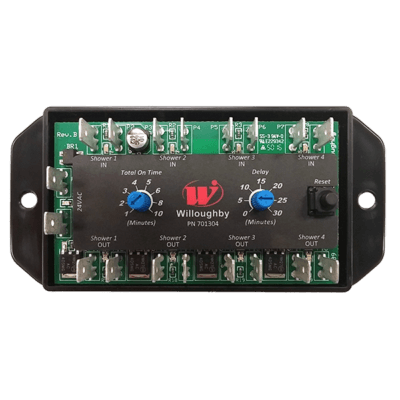 The Willoughby WUSC-2200 Electronic Water Usage 2-Shower Controller is a stand-alone electronic module designed to control the operation of up to 2 electronic shower valves, either from inside a shower fixture or from the mechanical chase. 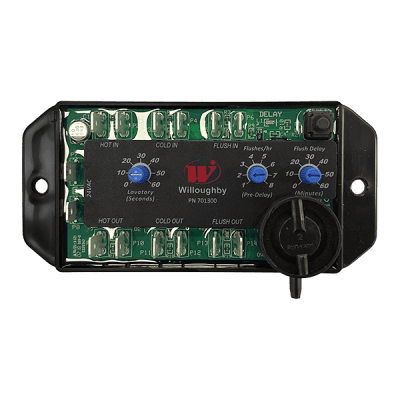 The WUSC-2200 controller is capable of controlling a total of 2 low-voltage solenoid flush valves. All input, output, and power functions of the controller have corresponding LED diagnostic indicators for testing and monitoring, as well as a reset push button to restore controller functionality. The WUSC-2200 controller will come with a TF24H hard-wired 110VAC to 24VAC transformer and appropriate WUSC-KIT controller wiring kit. The WUSC-2200 2-Shower Controller is recommended for correctional facilities and other applications that would benefit from water conservation, usage control, and the abatement of potential vandalism, and is compatible with nearly all Willoughby shower fixtures equipped with electronic valves. The Willoughby WUSC-2400 Electronic Water Usage 4-Shower Controller is a stand-alone electronic module designed to control the operation of up to 4 electronic shower valves, either from inside a shower fixture or from the mechanical chase. 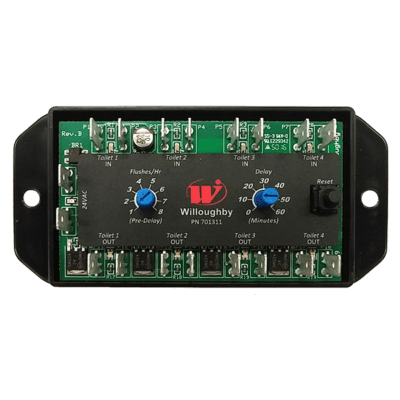 The WUSC-2400 controller is capable of controlling a total of 4 low-voltage solenoid flush valves. All input, output, and power functions of the controller have corresponding LED diagnostic indicators for testing and monitoring, as well as a reset push button to restore controller functionality. 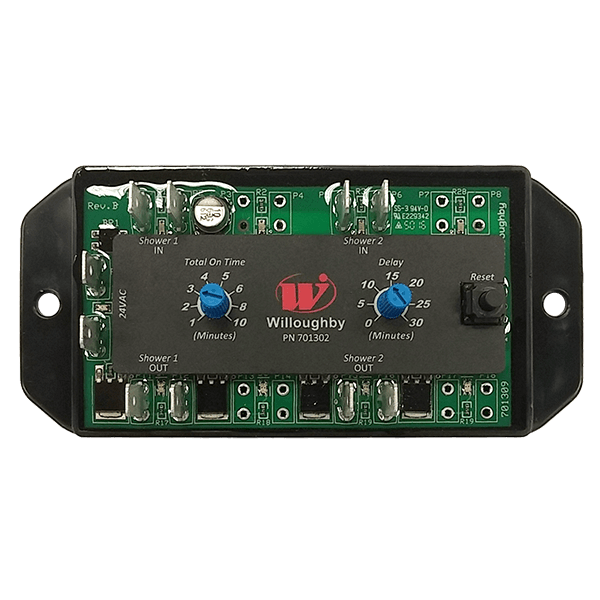 The WUSC-2400 controller will come with a TF24H hard-wired 110VAC to 24VAC transformer and appropriate WUSC-KIT controller wiring kit. 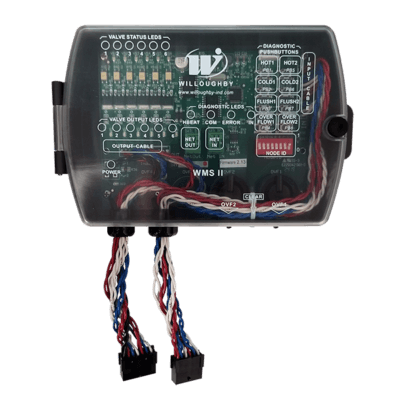 The WUSC-2400 4-Shower Controller is recommended for correctional facilities and other applications that would benefit from water conservation, usage control, and the abatement of potential vandalism, and is compatible with nearly all Willoughby shower fixtures equipped with electronic valves.